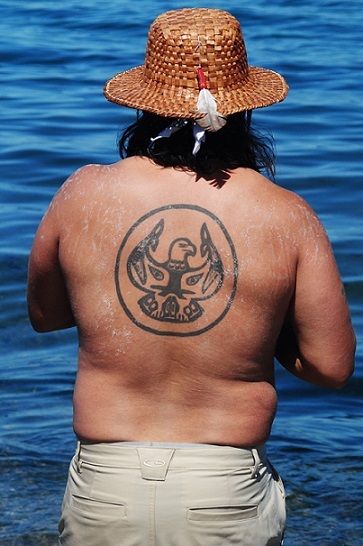 As I looked out from the beach in West Seattle, they appeared as specks on the horizon. 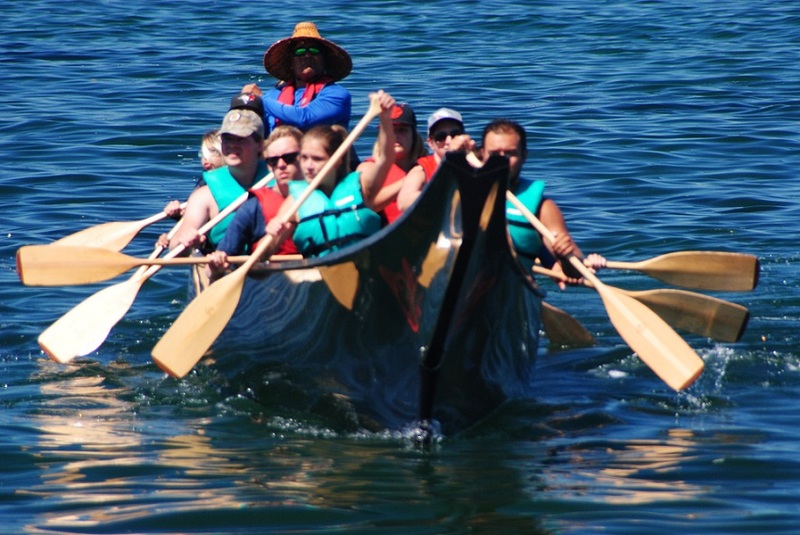 But as they inched closer, if I looked hard enough, I could see their paddles undulating in unison. 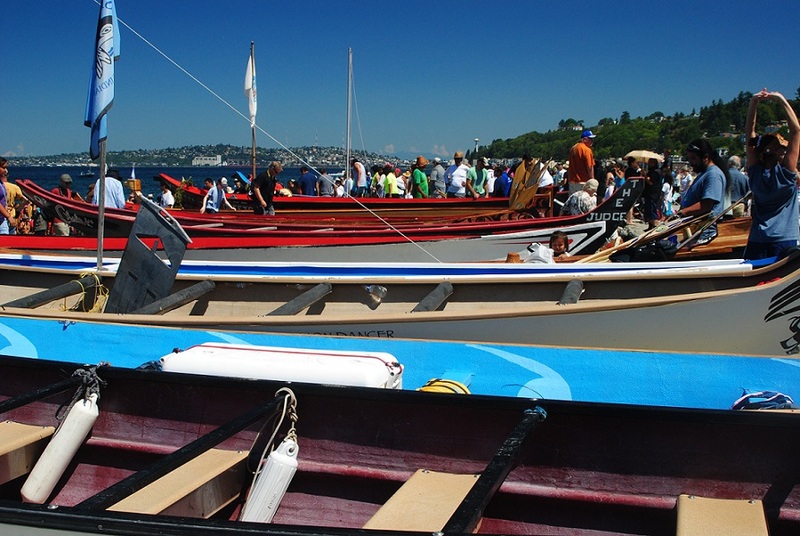 They made me think of Viking ships with dozens of long wooden oars pushing the boat through the sea. They were coming! 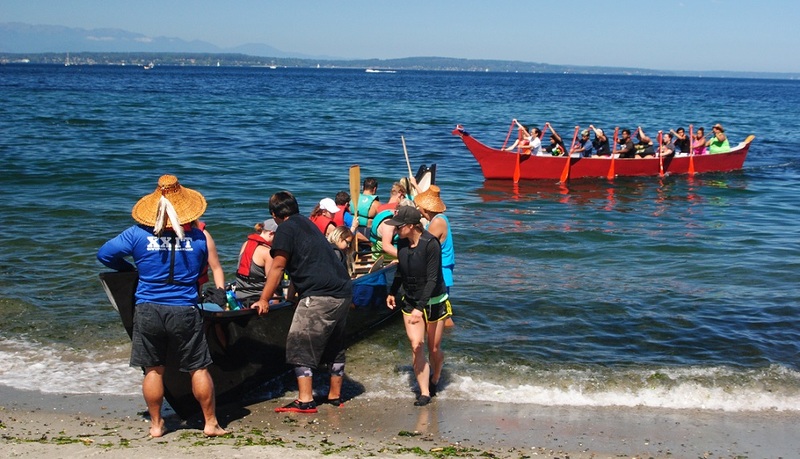 Suquamish, Makah, Swinomish, Jamestown S’Klallam, Squaxin, Cowichan, Quileute and many more tribal members participating in the annual canoe journey in the Northwest. 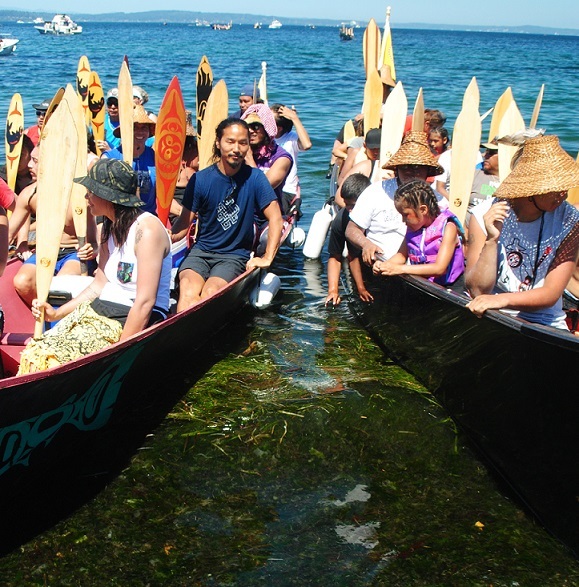 This year’s celebration, the Paddle to Nisqually, journeyed to the Nisqually Tribe’s lands near Olympia in July. 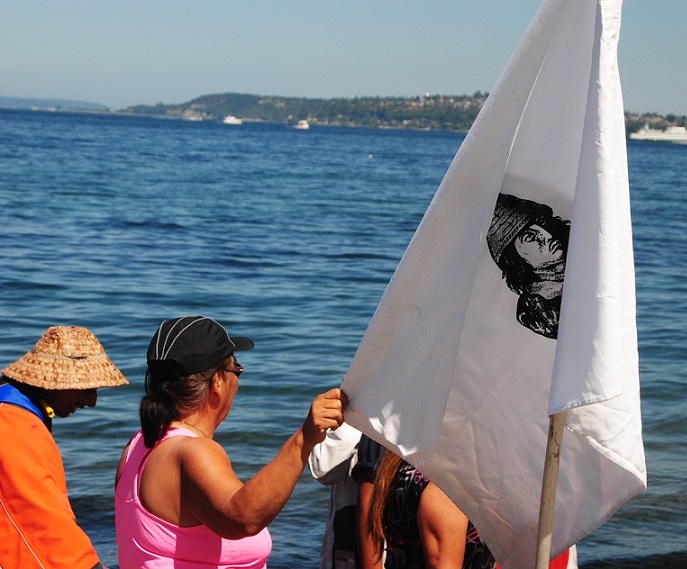 But first, the paddlers converged at Alki Beach in West Seattle, to be welcomed by representatives of the Muckleshoot Tribe, on whose territory they had landed. 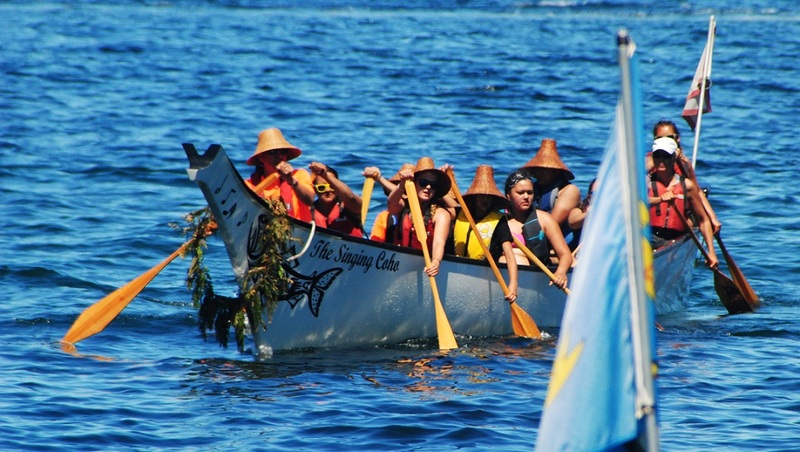 More than 70 canoes from Washington and Canada were making their way on a physical and spiritual journey. 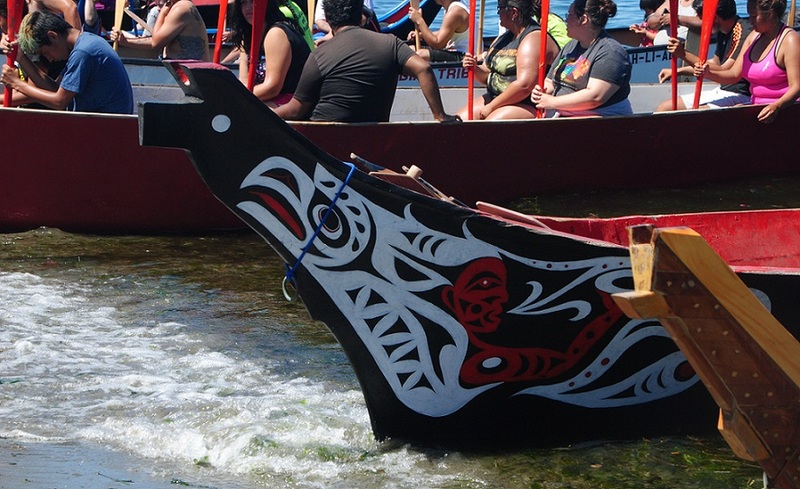 From Seattle, the canoes would travel over Puget Sound to the tribal lands of the Nisqually, hosts for this year’s cultural ceremony. 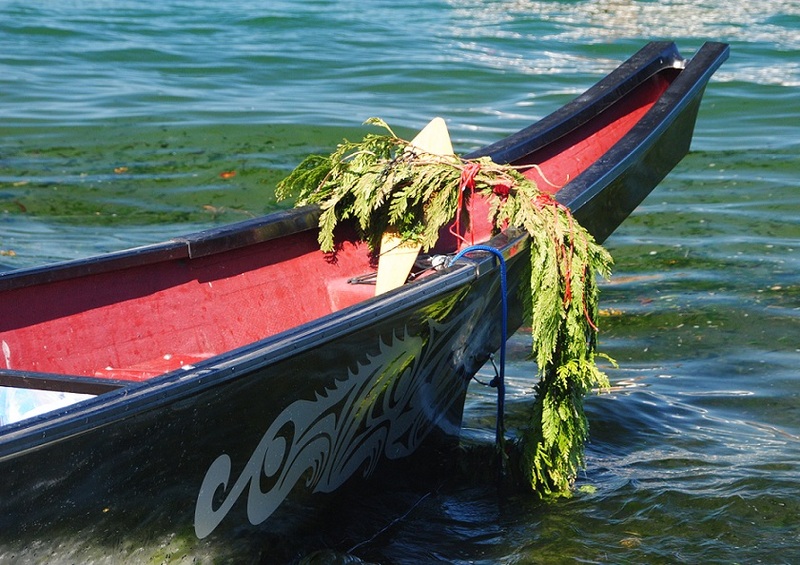 In the past, canoes have even carried Native Hawaiians, Inuit and Maori to the tribal ceremony. 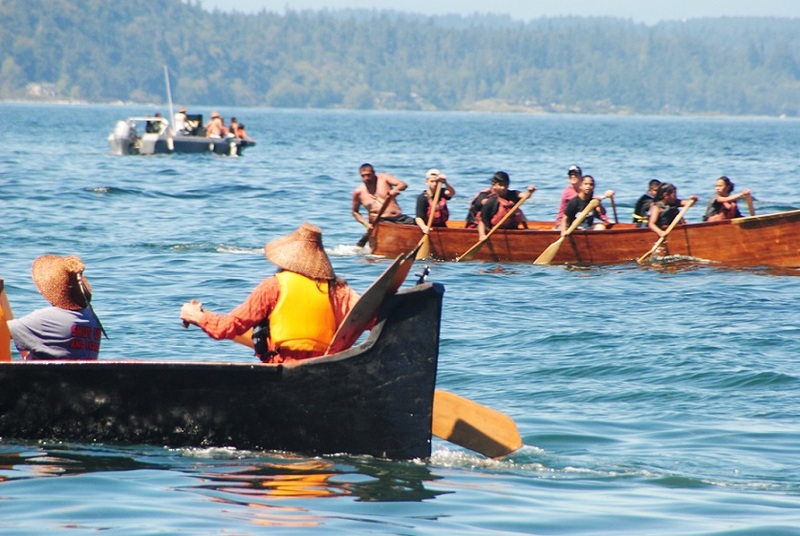 It’s hard to imagine human beings paddling across an ocean. 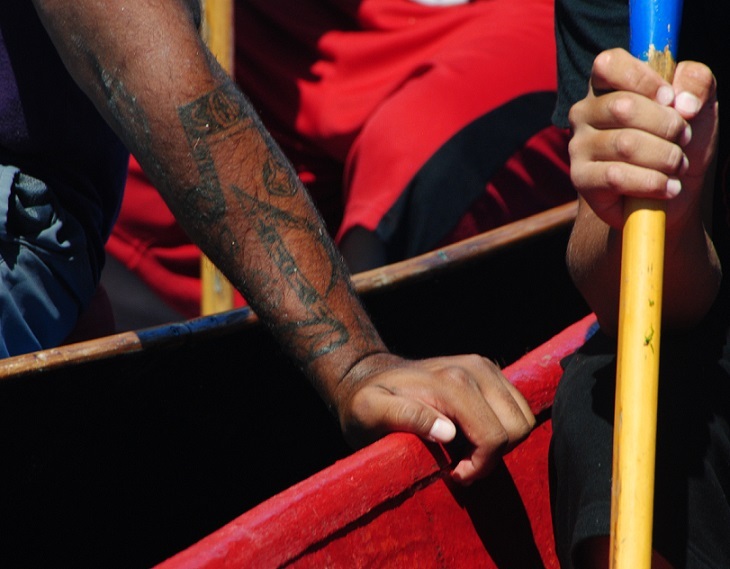 Of course, they have support boats accompanying them, and change paddlers to provide rest during the journey. But still! 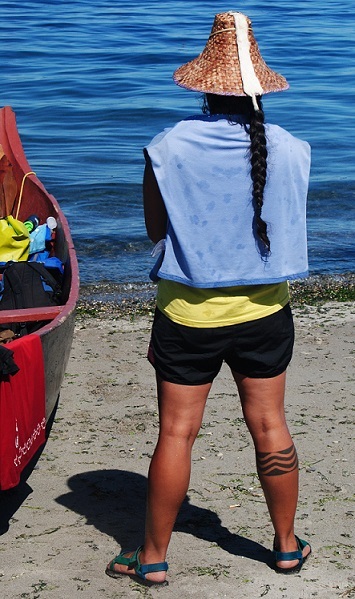 As the canoes arrived at the beach, the paddlers pulled them ashore, temporarily. 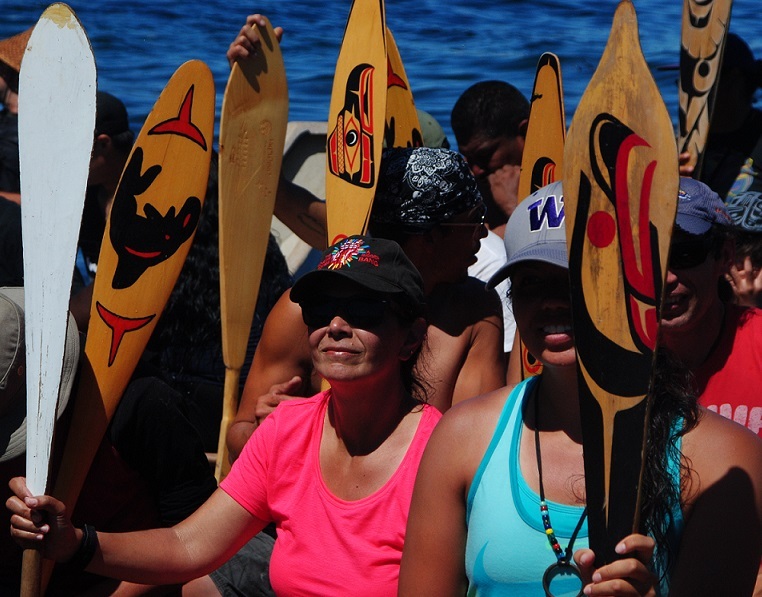 Then, as more participants arrived, they went back into the water and paddled around together. I understood that this was part of the tradition. 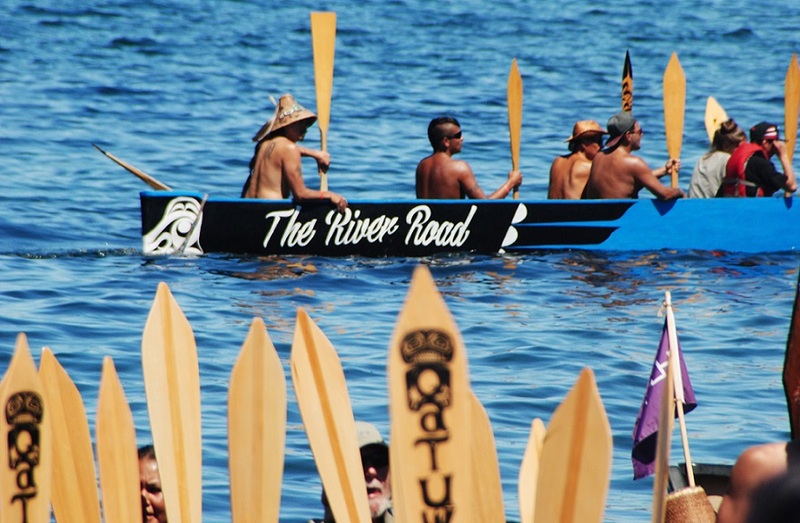 After a few dozen canoes had arrived, the crews assembled close to the beach, lining up the boats and sitting with their paddles held straight up. 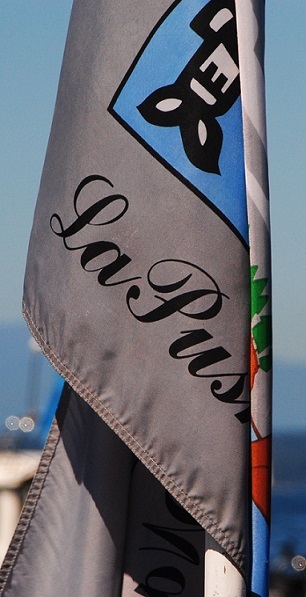 They waited to be welcomed ashore. 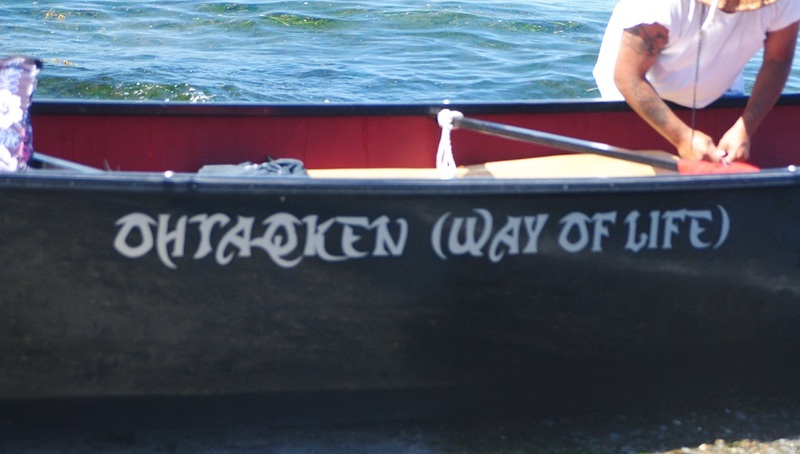 Each canoe asked permission from the Muckleshoot Tribe, hosts for this part of the journey. 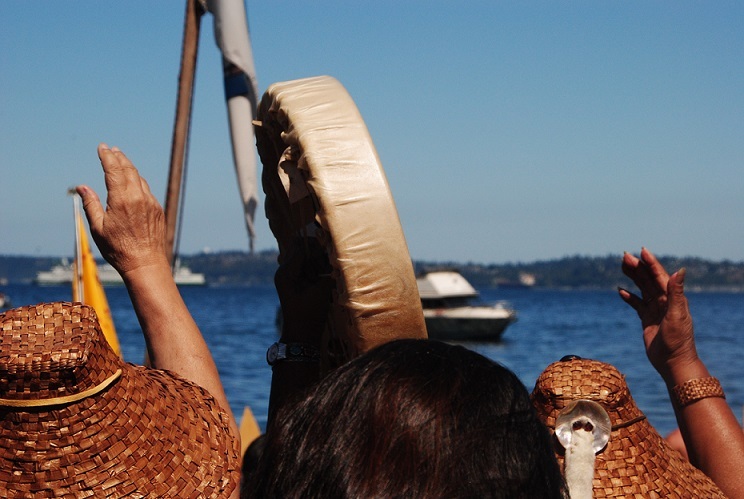 Women of the Muckleshoots then spoke to each canoe in turn, speaking in their language and beating a small drum. 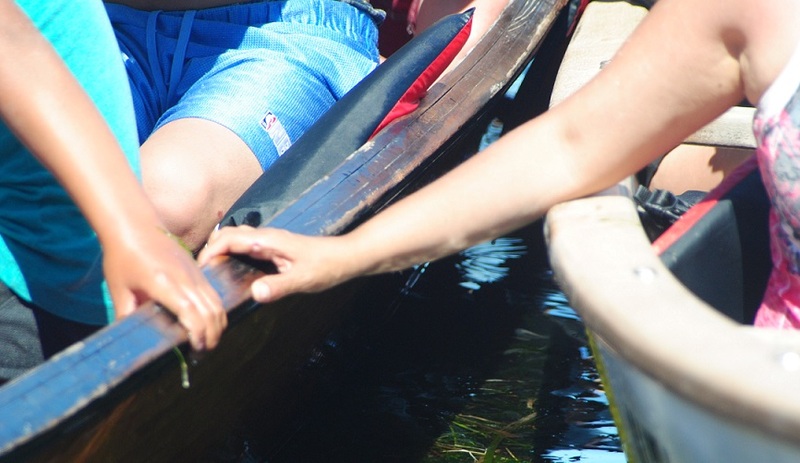 As each canoe was welcomed, the paddlers pulled it ashore and carried it up onto the land for the night. Men, women and teens helped shoulder the load. 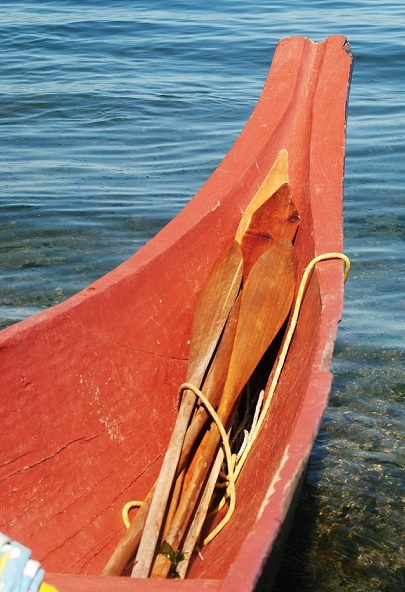 The authentic dugout canoes looked pretty heavy! 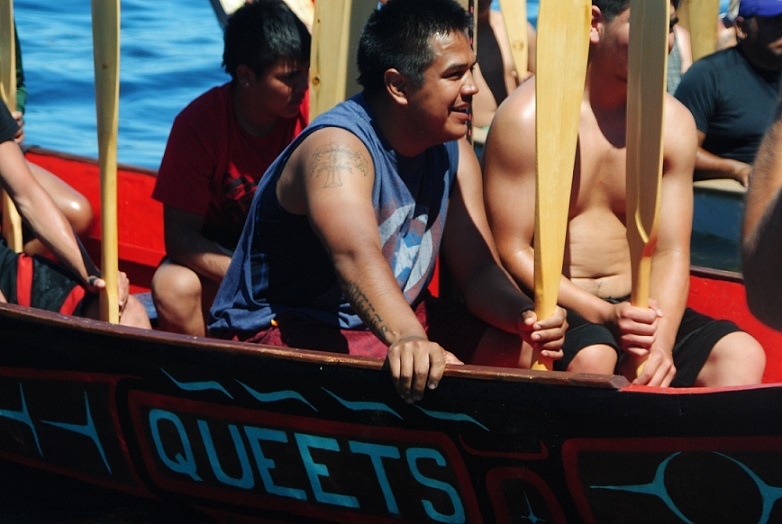 The participants welcomed outsiders to witness their journey, admire their canoes and chat with them. 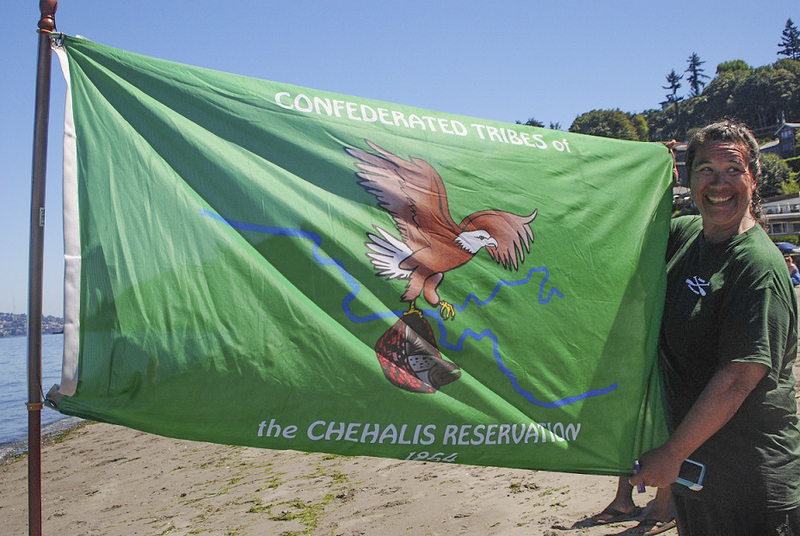 I met a woman who came from Neah Bay, all the way at the western tip of the state. 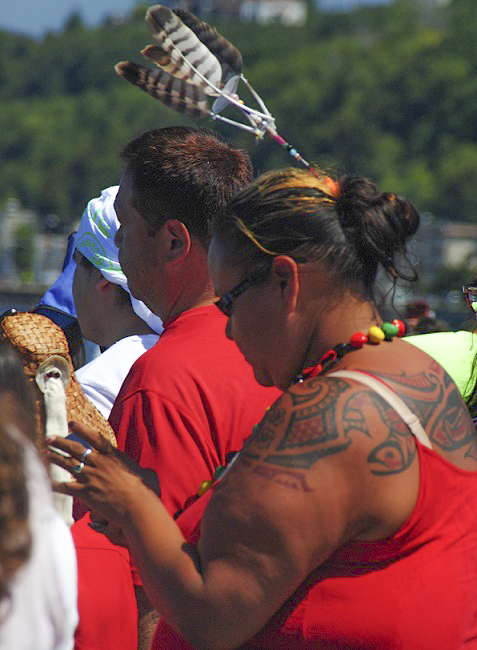 I had visited Neah Bay years ago, and recalled its beauty and wonderful smoked salmon! 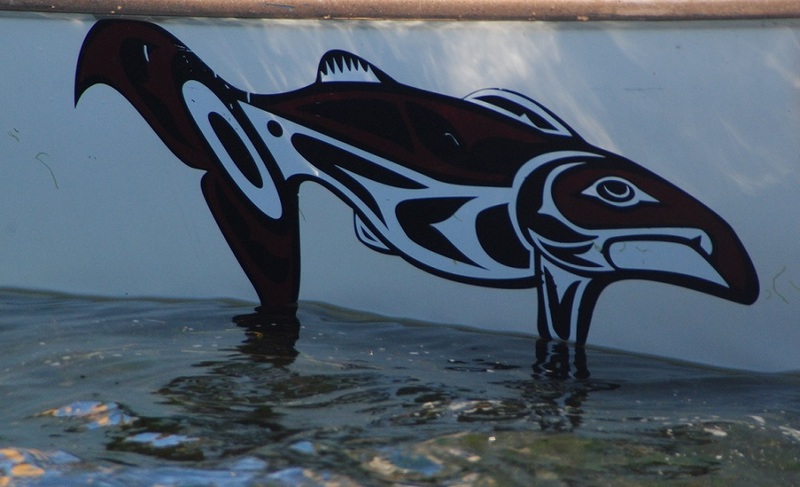 I enjoyed checking out their canoes, many with native paintings and words. 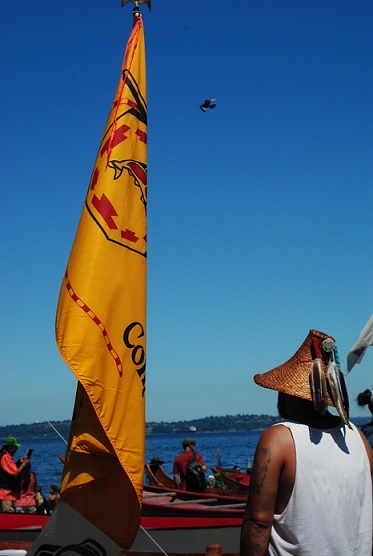 Some paddles also had native art, and many canoes flew flags of their tribes. 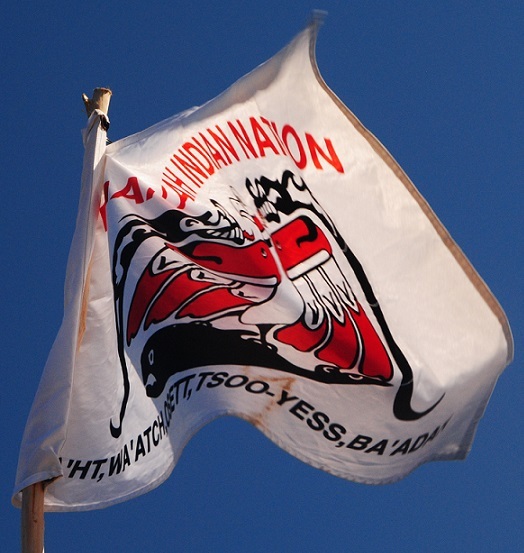 It was inspirational to see such a large group of people, coming together to celebrate and strengthen their cultures and community, and in many cases to restore their own well-being along the way. I hope the rest of their journey was peaceful.